When I last spoke with Craig Leshen, President of OAO, he was helping explain that programmatic isn’t automatic – there’s still a lot of manual work that goes into these new systems. While they have helped to simplify certain functions, in many ways these systems have added to the complexity of the ad operations role by creating additional tasks and knowledge sets required to do the job. Rob Beeler: What is an example of something that has become easier for ad operations? Craig Leshen: The process of implementing audience extension campaigns has become much more streamlined over the years and is a terrific way to target ads to users. It’s a type of targeting that has always had enormous potential but continues to be drastically under-utilized. Audience extension allows publishers to deploy targeted advertising campaigns to their users anywhere online by identifying them as users of their content. Another way of saying this would be that publishers can sell more inventory to advertisers, targeted to their users, without having to create additional advertising space on their own online properties. RB: Sounds like a no brainier; extremely logical. What were some of the factors that made it tough to do in the earlier days of online advertising? CL: In the past, the allure of audience extension was there, but the process wasn’t regularly used due to the complexities regarding deployment. Publishers could easily apply pixels from their ad systems to their sites to capture their users, but only a few systems were able to use this data. Audience extension was also something that sounded fantastic, as does most of the new ad tech in our industry. Talking or thinking about working with it is very different than actually implementing it; if it’s complicated to implement and manage, the number of these types of campaigns will be limited. You also have to factor in that there was a sales barrier. The industry was younger and salespeople, for the most part, knew far less about ad technology than they do today. A lot of salespeople had the “stick with what works” mentality because it was an easier sell. Ad dollars were (and always are) fragile, so the idea was to stay within their comfort zone, avoid risk, and not over-complicate the sales process; just bring in the revenue. If the advertisers were not asking for it, it was better not to push for it. Sales, ad ops and the systems used to implement advanced campaign targeting all needed to develop further from a technical standpoint to help the number of audience extension campaigns scale significantly across our industry. RB: How have things changed? CL: With the rise of programmatic and monetization systems, it’s become far easier to deploy audience extension campaigns. Sometimes these systems do it automatically because audience extension targeting is part of their technology. Understand that if a programmatic or monetization system is running advertising on your site, it could capture data which can label a user as someone who has visited your site, and then continue to target that user based on compiled audience profiles. This allows these systems to offer more to their advertisers, and in turn, earn more revenue for their publishers. However, while programmatic and monetization systems can take care of this for publishers, cutting the deal directly with the advertiser will typically net out more to the publisher; it removes the middleman (or “middle-system”). Publishers can use a variety of systems to target direct-sold campaigns to their users across third-party inventory accessible by these systems. In addition, as ad technology became more advanced, so did the people who work with it – both ad ops and sales. The sales barrier I was talking about a minute ago has been chipped away at over the years. Salespeople are now more comfortable than ever proposing advanced targeting options to advertisers. They understand advanced ad technologies and targeting methodologies – such as audience extension – that media buyers have budget allocated for, and publisher ad ops teams have the tools and skill sets to effectively and efficiently deploy them. RB: So publishers have all the resources they need to do this, but many don’t do it. Why are they missing the opportunity? CL: I don’t think they’re missing the opportunity as much as they just have so many opportunities to choose from when putting together proposals for media buyers. Some might argue that there are more potential buy types, creative types, platforms, screens, devices, or ways to target ads, than there are seats in the Rose Bowl. Ok, well maybe not that many… yet. That’s definitely part of it, but you also need to consider that with any sort of advanced targeting, you need to spend time learning about it and working with it so you can properly offer it to your advertisers. 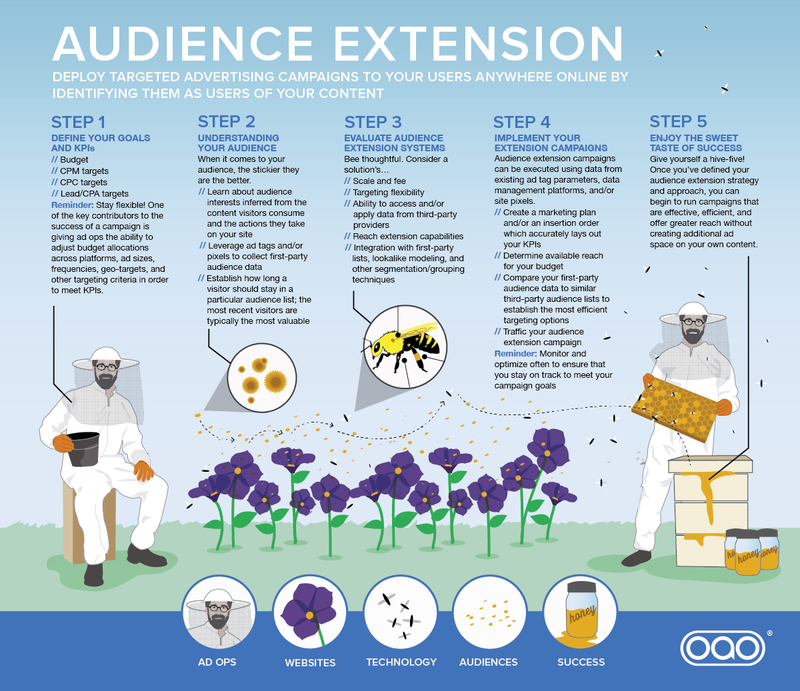 We put together an infographic which illustrates and details the items publishers should consider when they’re thinking about running audience extension campaigns. RB: Is audience extension an example of something that has gotten better for ops? CL: Certain things, such as audience extension targeting, have become easier; they had to so the industry could grow rapidly, and it continues on that trajectory. Many ops functions have become easier as technology improved and grew more advanced. However, while some of what was once complex has been simplified, a lot of the newer types of targeting, creative type, and enhanced analytics we can extract from data have not yet reached the point where they are easier to tackle. They’re too new or raw, to be actionable in a streamlined way. Ops is hard. “If it wasn’t hard, everyone would do it. The hard is what makes it great.” Ok, so I borrowed that quote from “A League of Their Own.” It works. RB: Give our readers an example of an audience extension campaign. CL: A few years back, Ford was running ad spots with Derek Jeter in them. Let’s say the Yankees were running these ads on their site. They could have also worked with a system that allows for audience extension targeting to serve more of the Ford ads to Yankees users on other online properties. If they wanted to further enhance their targeting, they could have worked with a data service provider to figure out which of their users were also automotive enthusiasts, or automotive purchase intenders, and then targeted those specific users when they were on the Yankees website or via audience extension on other online properties. RB: Awesome. Audience extension combined with the application of additional data to improve campaign performance for the advertiser. Love it! What’s next? What do you think this will lead to? CL: Here’s something. Why should publishers only do this for their advertisers? They’re running paid ads on their websites, mobile apps, connected devices, etc, but they’re running their own internal marketing ads too. What if publishers decided to have their ad ops team utilize audience extension targeting to run their own marketing campaigns on other online properties? Let’s keep going… Why stop at targeting to their own audience? They could also target their marketing ads via reach extension campaigns (delivering ads to users within similar verticals and audience groups, who might not already be known to the publisher), along with a whole slew of other campaign types. Rob Beeler is AdMonsters Chairman. He became Publisher for AdMonsters in 2015 after serving as Vice President of Content and Media overseeing the development of content for AdMonsters events and Editor in Chief for AdMonsters.com. Rob Beeler joined AdMonsters in October 2008 after nearly 10 years at Advance Internet, a leading creator of local news and information web sites across the United States. At Advance Internet, Rob started as the only Ad Operations person and developed a department of 15 people in 8 locations across the country responsible for operations, project management, business development, web analytics and financial reporting, becoming Executive Director of Ad Operations and Analytics in early 2007.